If you are on vacation in Lisbon, you may well need to take a break. Not a break that involves touring and visits to the legendary sites of the city, but one of those phases where you can sit by a tree and breathe deeply. If you like this idea, I have a suggestion to make which lies to the southwest of the Forest Park of Monsanto and is characterized by a long garden with dividers on each bank and an extensive lake in the centre. Today, this old tea house, which has been converted into a luxurious event space, remains famous for its beautiful garden overlooking the forest, however, the Belvedere has lost much of its view due to the excessive height of the trees surrounding it. From the viewpoints to the Southeast, Southwest and Northwest, there remains only the last one, whose view over Alfragide and Amadora has very little tourist interest. 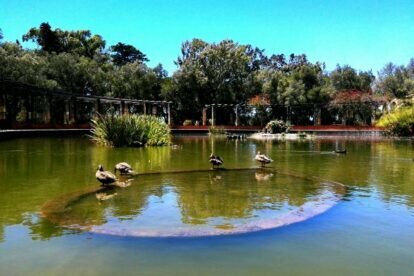 At the end of the garden, after the stone pergola of the lake, there is a descending rail where you can still see the mouth of the Tagus River off the Cova do Vapor in the municipality of Almada. The Montes Claros Miradouro invites you for a long walk along the shores of this garden. Talk, read, meditate. It is an extremely serene and remote place from the great city bustle. Perhaps you could have a picnic or even take a nap!